The Detective Story Club's first short story anthology is based around a London detective club and includes three newly discovered tales unpublished for 100 years, plus a story bearing an uncanny resemblance to a Conan Doyle Sherlock Holmes story but written some seven years earlier. 'You will seek in vain in any book of reference for the name of The Crime Club. Its watchword is secrecy. Its members wear the mask of mystery, but they form the most powerful organisation against master criminals ever known. The Crime Club is an international club composed of men, but they spend their lives studying crime and criminals. In its headquarters are to be found men from Scotland Yard and many foreign detectives and secret service agents. This book tells of their greatest victories over crime and is written, in association with George Dilnot, by a former member of the criminal investigation department of Scotland Yard.' 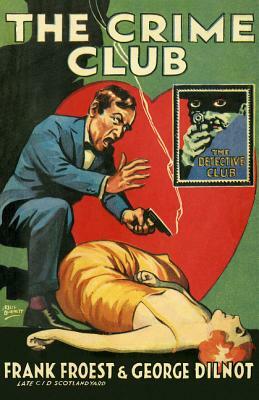 With its highly evocative title, The Crime Club was the first collection of short stories published by the Detective Story Club. Co-authored by CID Superintendent Frank Fro'st and police historian George Dilnot, these entertaining mysteries left readers guessing how many were based on true cases. This Detective Story Club classic is introduced by David Brawn, who looks at how the The Crime Club inspired a turning point in British book publishing, and includes three newly discovered stories by Fro'st and Dilnot. Frank Castle Fro'st was born in the West of England around 1858. He joined the Metropolitan Police as a police constable in 1879 and worked his way up to Inspector at Scotland Yard by 1894, Chief Inspector in 1903 and Superintendent of the Criminal Investigation Department (CID) from 1906 to his retirement in 1912. Working with the journalist George Dilnot, he wrote The Grell Mystery (1913), the story collection The Crime Club (1915) and The Rogues' Syndicate (1916). After his wife died in 1916, Frank moved into politics and was elected to Somerset County Council. He died in 1930.